The merchant offers 6 installment payments, without interest, for Brazilian credit cards. With credit cards, merchants sometimes offer Brazilians the option to pay in installments (parcelado). This only works with Brazilian credit cards, that is, credit cards issued by a Brazilian bank. A visitor with an international credit card has to pay all at once. The phrase for "all at once" is à vista for this situation. The number of installments (parcelas) to offer — or to offer it at all — is up to the vendor. For example, it could be 1x, 3x, 6x, and 10x, where 1x means the whole payment at once, 3x means 3 equal monthly payments of 1/3 of the price, and so on. 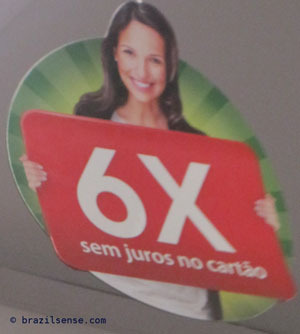 Normally, the customer pays no interest (sem juros) if the number of installments is 10x or fewer. If it's greater than 10x, the store's ad will have fine print about the interest rate. The interest is charged by the card issuer (i.e., the bank), not by the store. After the transaction is done, the store gets full payment from the card issuer; the installment payments and any interest are then between the customer and his bank; the store is no longer involved. The store is charged a fee for offering this service, and the fee is greater for more installments. Therefore some merchants don't offer it. Yet many vendors do offer it because it draws customers. It's generally found on larger purchases and/or high margin businesses, like airline tickets, furniture, appliances, shoes. You won't find it at supermarkets and restaurants. You'll often hear the expression à vista when dealing with money, and there is some confusion about it. Many guide books and Brazilians translate this expression as "in cash", but that's misleading. A better translation is "all at once". Even in English, "in cash" is ambiguous. If you say, "I paid my restaurant bill in cash", you paid with paper money as opposed to a credit card. However, if someone says, "I paid cash for my car/house", they probably don't mean that they filled a wheelbarrow with thousands of $20 dollar bills and delivered it to the seller. They probably paid with a check, bank draft, or bank-to-bank transfer, but they want to emphasize that they did not obtain a mortgage or financing. They had all the money available. It's the same in Portuguese. À vista refers to any kind of payment made all at once, be it physical money or debit card. With credit cards, if you pay all at once, as opposed to installments, then another expression is that you paid "one time" (uma vez).